﻿How to Check an SEO Consultant is an SEO Expert? Way too many of the SEO consultants working in the search engine optimization sector haven’t a clue what they are doing, especially regarding technical SEO issues. I would even go as far to say the vast majority of businesses working in the SEO industry are selling SEO snake oil! I plan to prove my technical SEO expertise while teaching the reader how to determine if an SEO consultant is indeed an SEO expert. When is an SEO Expert NOT an Expert? 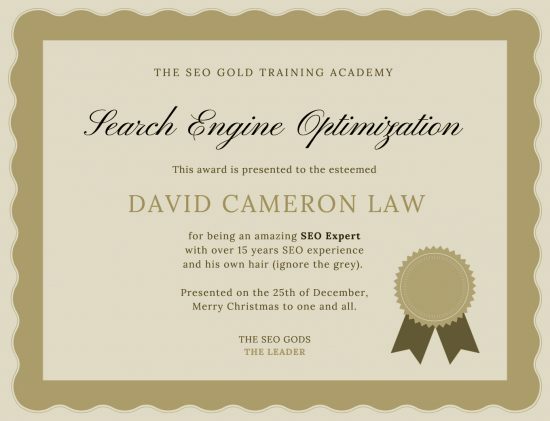 It’s very easy to call yourself an expert in a field with no industry recognized search engine optimization qualifications and where many of the “SEO qualifications” (cough) available appear to be a joke: see The Value of SEO Training Certification especially the section discussing Diplomas in SEO and Digital Marketing Courses for as little as £19! I suggest ignoring any SEO certificates, probably not worth the paper they are written on. In fact if an SEO consultant or SEO agency tries to convince you they have the relevant skills because of qualifications like the one described at the link above, assume they are SEO snake oil sales marketing people. How can a business owner with little to no SEO skills determine if an SEO consultant is indeed an expert? The first thing they should NOT do is only rely on Google searches for phrases like SEO Expert, SEO Consultant, SEO Guru etc… and ASSUME the top results are owned/managed by experts in the search engine optimization field. I realize it seems counter intuitive, but ranking high for SEO relevant SERPs doesn’t necessarily mean the owner(s) of the site can achieve the same for an SEO clients site. 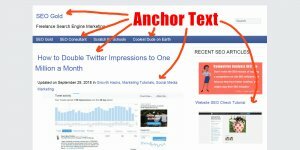 There are hundreds of Google SEO ranking factors and a major ranking factor is backlinks and the associated anchor text. There’s lots of websites managed by webmasters without a clue about SEO who are outperforming real SEO experts because they managed to generate a lot of backlinks (a business could simply buy backlinks) or a small number of very high quality links. The links could be through hard work or luck, no easy way to say without detailed research. 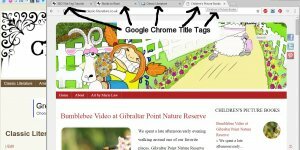 I met a computer software engineer over a decade ago who had created a simple logo for a popular open source software product and the logo generated his personal site some really high quality backlinks: the sort of links businesses would pay thousands of dollars a year for. His personal sites home page was PR7: this was when Google showed toolbar PageRank (a log scale between 0-10), gaining PR6+ webpages was impressive. A high PageRank website tends to mean the site has a lot of potential Google ranking power, he passed some of that SEO link power (via links) to his business website. 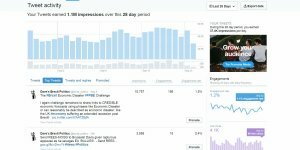 The business site ranked for some good traffic keyword phrases, but he never really dominated the SERPs because he wasn’t an SEO expert, just lucky on some backlinks. He would not be able to replicate the backlink success for an SEO clients site IF he worked as an SEO consultant: the success was due to a lucky break, NOT SEO skill per se. In a similar way I generated millions of backlinks to a site by creating free AdSense Ready WordPress SEO themes at a time when few were available. I could try to replicate it again for a relevant site (a site about WordPress themes or AdSense), but I couldn’t use this link building technique for say an ecommerce site selling mobile phones: IF Google spotted millions of backlinks from the footer of WordPress themes to a mobile phone site it would at best discount them (ignore them), but at worst give the site a penalty! Another very good example is the WordPress SEO relevant search engine rankings for the yoast.com domain, it’s owned by the creator of the Yoast WordPress SEO Plugin, Joost de Valk. Prior to 2010 there was basically one really popular WordPress SEO Plugin: The “All In One SEO Pack” plugin. Millions of WordPress users used it (today it has over 44 million downloads: 3+ million active installations), then a new kid came on the block called “WordPress SEO by Yoast” (today it has over 88 million downloads: active installations not reported!). Way back in 2010 from an SEO perspective the two plugins achieved similar things, it was pretty much modify the title tags (title tags have significant SEO value), add meta descriptions (no SEO ranking value per se, but Google uses it like an ad so can increase CTR) and meta keywords tag (Google NEVER used the keywords meta tag, waste of time adding them). Real SEO experts didn’t use these WordPress plugins because it was easy to add better technical SEO by other means, but non-SEO understanding WordPress users thought they were the best thing since sliced bread: they still do! What was interesting about the two WordPress plugins was the branding. The “All In One SEO Pack” only had one SEO relevant keyword (SEO) in the plugins name, whilst the “WordPress SEO by Yoast” plugin had two relevant keywords: “WordPress” and “SEO” which also covers the “WordPress SEO” phrase. The brand name Yoast is also very easy to remember (it’s relatively unique like Google, Twitter, FaceBook…) whilst the All In One SEO Pack was from a company called Semper Fi Web Design: I had to look it up to confirm it, recalled it was Semper Fi something. The Yoast plugin was also easier to use and looked newer, much fresher interface and many WordPress users preferred it to the older SEO plugin. 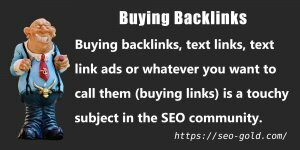 The All In One SEO Pack Plugin generated backlinks with anchor text including “All In One SEO Pack” and derivatives including the keyword Plugin. The WordPress SEO by Yoast Plugin generated backlinks with anchor text including “WordPress SEO by Yoast” and derivatives including the keyword Plugin. Google relies heavily on anchor text of backlinks (relied even more heavily on anchor text of backlinks at the time) and even if both sites gained the same number/quality of backlinks, the Yoast SEO plugin anchor text from an SEO perspective is much better: includes WordPress and SEO, also as the plugin became more popular some would simply search for Yoast to find the Yoast SEO plugin. I’ve no idea if the plugin developer planned this or whether it was luck, either way it worked: I’m impressed, it’s a really good example of branding working with SEO. 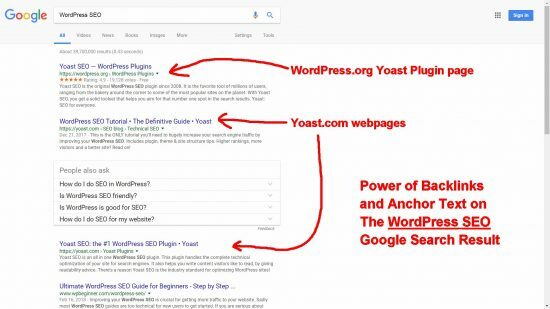 A Google search for WordPress SEO shows how this simple branding/naming difference (plus the fresher interface) has powered the Yoast site to the top for relevant WordPress SEO SERPs. The top result is the WordPress.org plugin page for the Yoast plugin, next two results are from the yoast.com domain. The All In One SEO Pack WordPress page and the developers site aren’t even in the top 20 for this SERP. 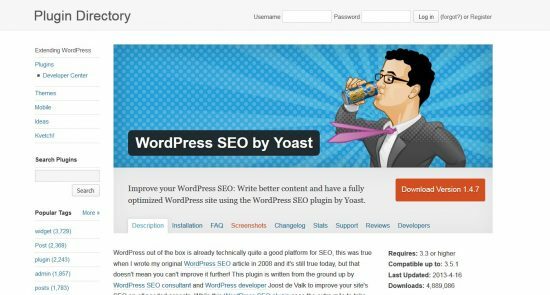 Note: 5+ years ago the plugin was promoted as “WordPress SEO by Yoast“, for example on the WordPress.org plugin page it was called “WordPress SEO by Yoast”: see the old screenshot above from 2013. Today it’s promoted as “Yoast SEO” (see the screenshot much higher up the page), had it started with this newer name I very much doubt it would have been as successful as the backlinks would tend to lack the anchor text WordPress. Today Yoast is a well known brand in the WordPress community, Yoast has become synonymous with WordPress SEO Plugin. It’s very impressive, but is it deserved, are the Yoast team (it’s a team of over 50 employees now: they built a business around a plugin with tens of millions of downloads) filled with SEO experts? If a business hired Yoast as their SEO agency** can they replicate this branding/SEO success for other websites? I very much doubt it and below I’ll try to explain why. 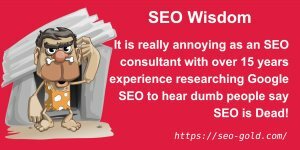 **Yoast isn’t an SEO agency and as far as I’m aware do not offer SEO consulting services per se, so could be argued I’m being a little unfair comparing them to an experienced SEO consultant like myself. They do however sell SEO training courses, SEO eBooks and organize something called YoastCon (an SEO conference) to their customers and do advertise their main product as “the #1 WordPress SEO plugin” so pointing out they don’t appear to understand technical SEO seems fair IMO. You decide if what I say below is fair? Without understanding the Yoast WordPress SEO branding information above, one might believe the people behind the Yoast plugin and Yoast site are SEO experts (they’ve built a successful business around WordPress SEO), but IMO they aren’t experts, far from it. 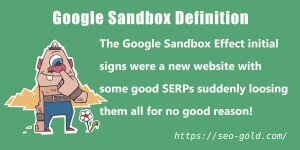 For example the Yoast founder and main SEO plugin developer (Joost de Valk) argued with me about how Google treated nofollow links despite the overwhelming evidence. He was completely wrong about nofollow and years later changed the Yoast plugins nofollow features (as I’d advised years earlier): during those years millions of websites running the Yoast WordPress SEO plugin were damaged SEO wise because he didn’t listen to a real technical SEO expert! IMO technical SEO experts (those who deal with servers, code and behind the scenes SEO optimization) should optimize their own websites to a very high standard. If they haven’t optimized their own sites code etc.., how can they advise on optimizing an SEO clients site? Let’s see if the Yoast site is search engine optimized, they have over 50 team members including three SEO consultants and over ten web developers: surely one of them understands technical SEO and has optimized the code behind the Yoast website they all rely on to earn a living. 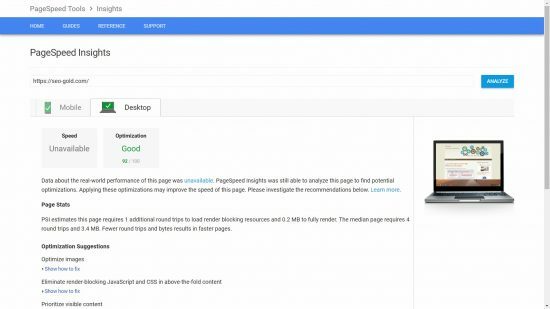 Google has provided webmasters with a couple of testing tools, the Google PageSpeed Insights tool (gives basic results) and the Google Lighthouse Audits Tools (more advanced results). 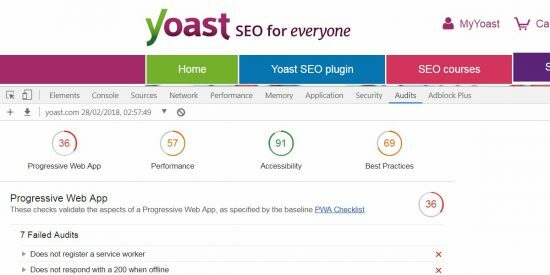 Let’s look at the yoast.com site in both the PageSpeed Insights Tool and the LightHouse Audits Tools. Your page has 7 blocking script resources and 4 blocking CSS resources. This causes a delay in rendering your page. For comparative purposes let’s see the SEO Gold sites home page results. 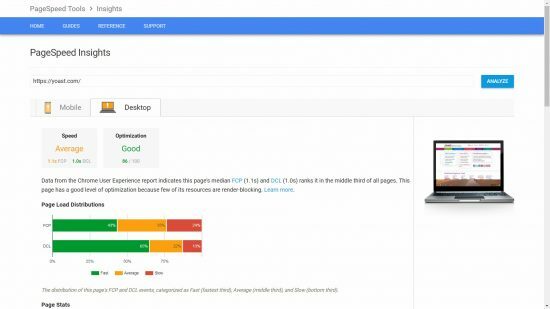 PageSpeed Insights gives quite basic results, let’s look at Google’s Lighthouse Audits Tool Results for a bit more detail. 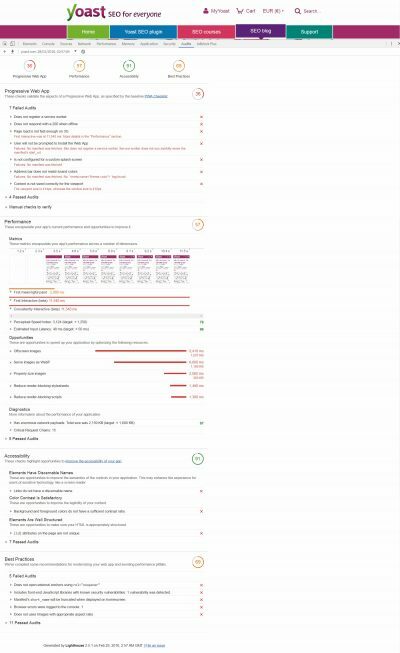 I’m using the Google Chrome built in version of the Lighthouse audits tool, if you want to do this SEO test yourself go to the Yoast home page with the Google Chrome browser and click the “menu” top right, followed by “More Tools” > “Developers Tools” > “Audits” and run the audits to see results like the ones below. 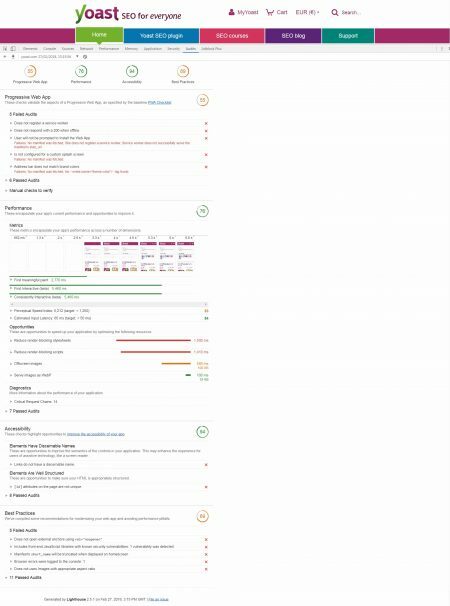 Looks like the Yoast webmasters/SEO consultants haven’t done anything regarding Progressive Web App support, really easy to score 100 on this one as well. Performance (which is a measure of speed) isn’t great, in particular issues with render blocking CSS and JS files. 1,500ms on render blocking stylesheets (CSS files). 1,410ms on render blocking scripts (js files). This means there’s an almost 3,000ms delay while CSS and JS files load! The problem here is like many WordPress powered sites the owner has added a bunch of theme and plugin features which add multiple CSS and JS files for various features (usually flashy features). I’m afraid if you want a flashy feature added by a theme/plugin it’s going to cost you speed, though there are SEO techniques to minimize the issue and in this case the Yoast team have NOT enabled those SEO techniques. To put this speed delay into perspective, Amazon ran speed tests on it’s site which found for every 100ms they lost 1% in sales!!! Google, Microsoft and others have run similar speed tests, with similar results. Speed really does matter and the Yoast site could be much faster with minor changes, for the Yoast site it’s the price paid for using jQuery features and having those in charge of technical SEO who do not know what they are doing. Also looks like they haven’t bothered with lazy loading off-screen images which adds a further 580ms. All these issues add to a site that’s slower than it should be. Solution: Upgrade jQuery to version 3.0.0 or higher. Note: This doesn’t mean yoast.com IS vulnerable, means there’s a possibility of a vulnerability. They are either unaware of the vulnerability or are taking a cyber security risk: believe their site isn’t at risk because of XYZ. Update: Sent the Yoast team a message regarding the potential cyber security issue, will add any relevant information (May 2018 update: 3 months has passed and no replay from Yoast and the vulnerability still exists). I also checked the Yoast WordPress SEO Plugin code (I’m not a Yoast user) for the above jQuery version and it is NOT part of the latest version. The above vulnerability is part of the Yoast domain, NOT the plugin. If you are a Yoast user and are worried, run your home page through the Lighthouse tool and check for yourself. 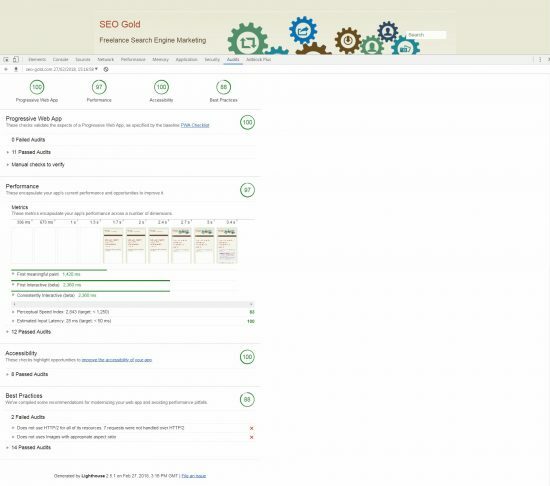 Now compare the Yoast home page Lighthouse report with the SEO Gold’s home page results. 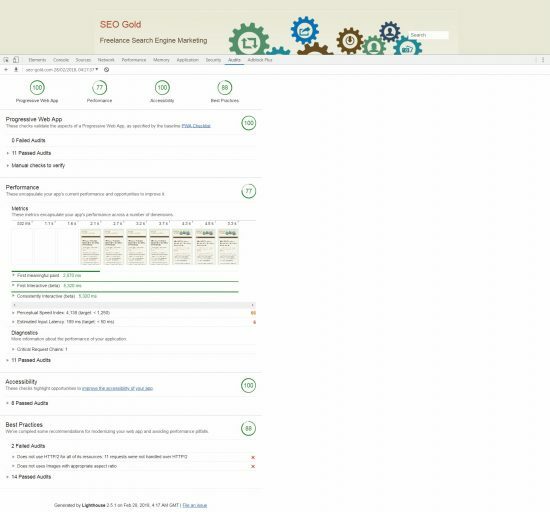 The SEO Gold home page has better results on all Lighthouse audit metrics. 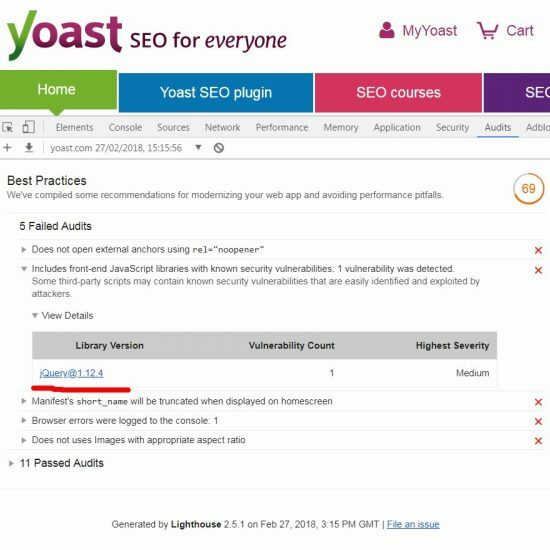 If a business hired Yoast as their SEO agency/SEO consultant could team Yoast guide them through their business websites Lighthouse Audits Report indicating what needs fixing and how? After writing the above sentence I searched the Yoast site for the word Lighthouse and found this article: https://yoast.com/google-lighthouse/ specifically about Lighthouse and one of the Yoast team “Edwin Toonen” (a Team Yoast Content Manager) has actually tested the Yoast Home Page with Lighthouse just 3 weeks ago! It’s a bit of a fluff piece and completely ignores all the bad issues including the jQuery vulnerability!! Is this the sort of SEO expert you want working on an important business site!!! WOW!!! Did I mention WOW! 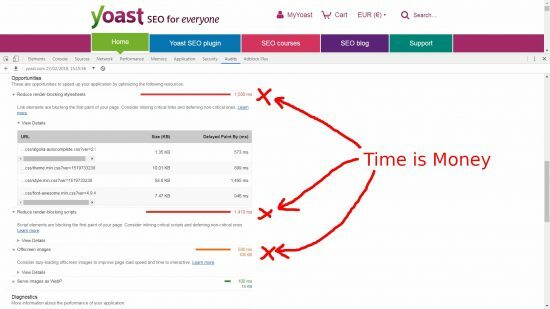 The Yoast team is meant to be awesome SEO wise, millions of WordPress users swear by the Yoast WordPress SEO plugin and presumably thousands have bought their SEO training, SEO eBooks and spent a fortune visiting YoastCon (sound like it should be called Yoast Con). Their response to mediocre Lighthouse test results on their own site is “does OK with a 75 overall” and “The first meaningful paint could be a bit better”! 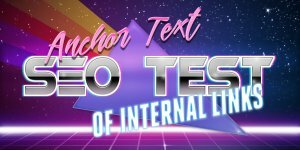 There’s nothing special about this WordPress Post, it’s an article with title “rel=canonical: the ultimate guide” from the “Technical SEO” category. The article consists of a fair amount of text (body content), couple of images and 38 user comments. As you can see from the Lighthouse screenshot above, the results are much worse that the home page results. Lighthouse performance is particularly bad at 57! There’s nothing special about this WordPress Post, it’s an article with title “Why SEO Training is Essential for Marketing Professionals” from the “Marketing Tutorials” category. The article consists of a lot of text (body content), 13 images (some big ones), and 3 user comments. Also includes 7 iFrames for the Twitter follow links near the bottom of the main content (like the Twitter follow link below). As you can see from the Lighthouse screenshot above, the results are much better than the Yoast results. Lighthouse performance is significantly better at 77 (20 higher than a Yoast article)! Perpetual Speed Index and Estimated Input Latency are below target, I believe this is because of the size of the webpage (it’s a BIG one). Don’t have this issue on smaller articles, but to give Yoast a chance I tested against one of my worst performing articles. Looking to Hire a Technical SEO Expert? If you were looking to hire a technical SEO expert, would you hire a team of 50+ people including almost a dozen web developers and 3 SEO consultants who have failed to even come close to optimizing the Yoast website for speed? Or would you hire someone like me, a self-employed jack of all trades (I do everything myself) SEO consultant who has excellent Google Lighthouse results with a site on a cheap Godaddy VPS server? Who do you think is the best technical SEO expert? I invite your comments below. 1 responses to How to Check an SEO Consultant is an SEO Expert? Leave a reply to How to Check an SEO Consultant is an SEO Expert?